If UK campaigners don't set the terms of our trading relationships, insisting they protect public services and standards, it will be left to Theresa May's expensive army of corporate lawyers. Sadly, the recent Brexit decision does not end the UK’s involvement in corporate-friendly, anti-democratic “trade” deals, like the Transatlantic Trade and Investment Partnership between the EU and US (TTIP) and the less noted EU/Canada Comprehensive Economic and Trade Agenda (CETA). Of course, the UK remains part of the European Union until the negotiations for our exit are completed, and trade and investment deals agreed by the EU during these interim years will still apply to us for some time. But far from Brexit saving us from these undemocratic trade deals, it seems our new crop of ministers is figuring out ways to impose similar deals on Britain regardless. The irony is that these moves come just as Europe-wide opposition to ‘trade deals’ may have actually left TTIP dead in the water as far as the EU goes. The Canada/EU deal CETA – planned to be forced through by 2017 – may also be threatened, not least by a civil lawsuit taken out by 100,000 citizens on the grounds that the treaty is unconstitutional. But there are already informal discussions on new, bilateral trade deals between the UK and other major economies, such as the US, China, India and Japan. Theresa May’s new ‘minister for Brexit’ David Davis suggests the UK might be able to make these new deals within two years. It seems that far from ‘taking back control’, we’ll be exposed to the same corporate interests that have already largely driven negotiations for CETA and TTIP with lobbyists for big business having privileged access behind closed doors. And following Brexit, whatever happens with the EU deals, those within the UK who decide to challenge the similar new bilateral deals will stand on their own. In thinking about how to fight these deals – and what to fight for - a look at how the CETA deal with Canada has snuck up on us without democratic process or even – possibly – veto – is educational. CETA is a ‘mixed’ agreement, which means that some parts of it go beyond the EU’s common commercial policy and so the treaty, in theory, has to be ratified by EU member states’ parliaments as well as the European Parliament. However, if and when the European Parliament endorses the deal, the European Council can provisionally implement CETA - or at least those parts of it that come within the scope of the EU’s common commercial policy - without the agreement of member states. The indications are that as much as 95% of CETA could be provisionally implemented in this way, including the infamous investor protection measure known as Investment Court System (ICS), the successor to ISDS (Investor-State Disputes Settlement). ICS will allow multinational corporations with subsidiaries in Canada to by-pass domestic courts and sue EU national governments for changes in policy or regulations that impact on corporate profits. After provisional implementation, if member states refuse to ratify CETA, corporations can still bring ICS claims for three years. This may seem less directly relevant to the UK as it heads towards Brexit. However it’s thought that corporate investments made between the provisional implementation of CETA and the UK's departure from the EU will continue to be protected by ICS for 20 years. Scandalous though that may sound, it get’s worse. When CETA is submitted to national parliaments, it seems that the UK Parliament is unable to veto it. This is not only because of the UK’s ambiguous position within the EU at the moment. Rather, in the UK there is no requirement for any Parliamentary debate or vote before a treaty is ratified and little clarity about how a debate or vote on ratification could be triggered. 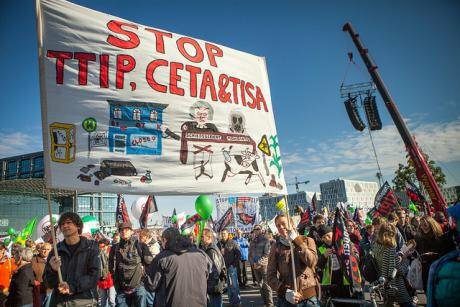 It seems that CETA can go through on the nod. And, according to the Constitutional Reform and Governance Act of 2010, even if there is a debate and a resolution is passed to veto CETA, the government can simply lay a statement before Parliament saying why they wish the treaty to be ratified, and it is then up to opponents to put forward another resolution to veto the deal …. and so on. Brexit does not mean that those who have been opposing CETA and TTIP can take a break: we still have to campaign against these deals. But it does mean, with regard to the new deals on the horizon, that we should go on the offensive, rather than waiting to respond to the agenda set by the new Department of International Trade and the private sector. Membership of the EU has meant that the UK hasn’t been involved in negotiating trade deals for over 40 years, and in the absence of in-house expertise, the government is turning to the private sector. The Head of the Civil Service, Sir Jeremy Heywood, has met with the Professional and Business Services Council (PBSC) to find staff who can be seconded to help with the complexities of withdrawing from the EU, including advising on complex trade agreements. The PBSC is made up of representatives from the business world, including the ‘big four’ accountancy firms (Deloitte, PricewaterhouseCoopers (PwC), Ernst & Young and KPMG); leading management consultants (such as McKinsey); and law firms (such as Linklaters). These companies are apparently keen to be involved, but their help will come at a substantial price: some have estimated the costs to be as high as £3.2 million per day for two years. Given the involvement of businesses like these in managing many aspects of Brexit - on top of the influence of lobbyists - we can expect the needs of corporations to continue to be foremost in negotiating future trade deals. So now is the time to push for the kind of trade agreements that we can support - ones that allow human rights - including access to public services - and issues like the protection of workers and the environment to be prioritised over the interests of corporations. It’s also the time to demand democratic control of trade and investment policies, including the reform of UK parliamentary process to ensure that our elective representatives can veto a bad deal.